Whether they're regular Dodge vans or repurposed Cadillacs, ambulances are cool. Yesterday, we asked you for your favorites, land or sea, real or animated. Here are the ten coolest. What&apos;s the coolest ambulance of all time? Why It's Cool: For what's ostensibly a comedy, Mother, Jugs & Speed gets downright dark at times. It starred Bill Cosby, Raquel Welch, and Harvey Keitel, as a ragtag group of EMTs working in Los Angeles. They're competing with another company for patient contracts, while battling all sorts of personal demons at he same time. The ambulance they use isn't particularly special, but movie is good, so it gets an honorable mention. Why It's Cool: Used in London at night or during bad weather conditions when the air ambulance helicopter can't fly, this WRX is dispatched with a pair of doctors to get to the scene first and start treatment. WRXs with light bars are cool, this one doubly so because it saves lives. Why It's Cool: This 265 saves lives in The Netherlands, where it was converted for duty by a Mitsubishi-owned company called NedCar, which now makes small, you guessed it, Mitsubishis. Why It's Cool: In addition to the medical teams posted along dangerous stretches of track, the Formula 1 circus travels with a team of six fully-equipped Medical Cars, some in the form of this C63 AMG. F1's Dr. Gary Hartstein is delivered to the scene of especially bad crashes, where he provides immediate care while calling in transportation to a ground hospital. Why It's Cool: Though now it doesn't so much save lives as it collects past ones, ECTO-1 started its life as an ambulance. Based on a 1959 Cadillac Miller-Meteor ambulance picked up for "only $4,800, but it needs some suspension work, shocks, brakes, brake pads..." the ECTO-1 eventually looks cool and helps save New York City. Why It's Cool: Starting in mid-1977, the W123 could be ordered in a long-wheelbase model at either 240D, 300D or 250 levels. These cars would form the basis for conversions to either ambulances or hearses. Why It's Cool: Mercy is the Navy's largest hospital ship, with 1000 beds on board and 12 operating rooms. Originally built as an oil tanker, Mercy was converted to hospital use and commissioned in 1986. She has travelled the world supporting the efforts of the U.S. Military on both land and sea, as well as providing humanitarian relief in non-combat situations. Why It's Cool: Arrive at the hospital in style in the back of a Citroen DS. Exactly the same as the regular DS, (and by that we mean "exactly as awesome") in ambulance form the car has an expanded rear area and adds lights and a siren to the roof. Everything else you know and love in a DS remains. Why It's Cool: Needing tacos can be a life-and-death matter. When you're hung over and need some Mexican food in you stat, it would be awesome to have a bright red food truck with lights and sirens pull up into your yard and save your life. Unfortnately, the Tacomergency ambulance is only a movie prop, and won't be bringing deliciousness to your door anytime soon. That said, whatever movie it's in is sure to be awesome. Why It's Cool: Ratchet is the chief Autobot medic in the Transformers universe. When in vehicle form he originally was a nondescript ambulance van, but now in the more recent Transformers films takes the form of a Hummer H2, outfitted for search and rescue. According to Michael Bay he stands somewhere around 20 feet tall, and has arms that can deploy a rotary saw and machine gun. Why It's Cool: This ambulance carries only one passenger, who's usually holding on for their life. Instead of having room for a patient in the back, this extremely rapid response vehicle carries a J-79 jet engine. It belongs to Pat Davidson, of Massachusetts, and he hand-built nearly everything on the truck. 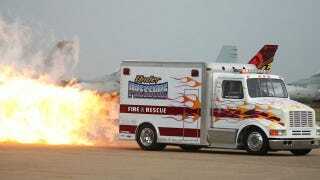 He does exhibition runs at airshows and drag strips all across the country, and has already gotten plans underway for a complete jet-powered emergency team with the purchase of a 1940 fire truck, currently with a Rolls Royce jet mounted in the back.